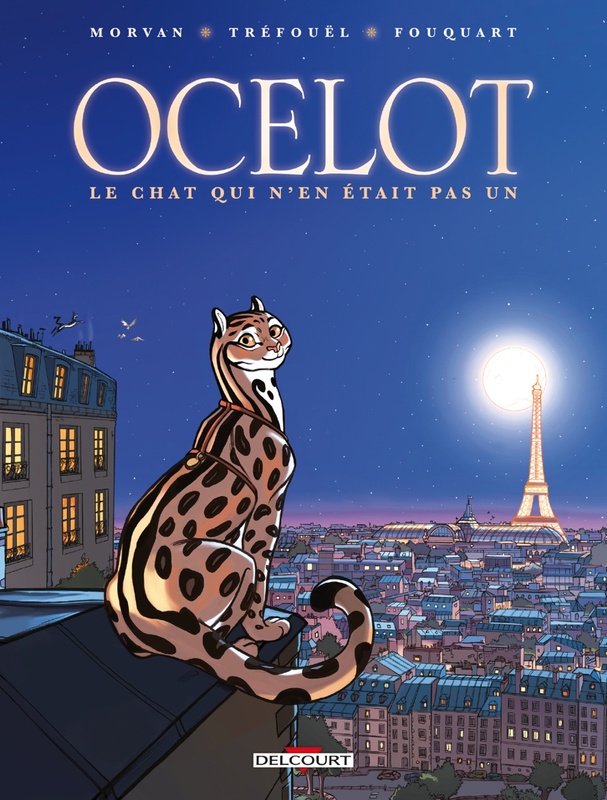 French Comic review by Fred Patten – Ocelot: Le Chat Qui N’en Etait Pas Un. Ocelot: Le Chat Qui N’en Était Pas Un, by Jean David Morvan & Séverine Tréfouël [writers] and Agnès Fouquart [art]. Paris, Delcourt, August 2015, hardcover €12,50 (48 pages), Kindle free. Thanks once again to Lex Nakashima for this fine example of the French bande dessinée. If you think that this story is familiar, it should be. The publisher itself says in its catalogue that Ocelot: The Cat Who Was Not One is “in the fashion of Lady and the Tramp”. Amazon.fr compares it to The Aristocats. (Les Aristochats.) You are advised “To read it with an empty mind and enjoy it”. (A lire pour se vider l’esprit et passer un bon moment.) In other words, just read it for fun. Tour modern Paris, the City of Lights, with a quartet of free-living cats. A flashback establishes how a young ocelot has come to be loose in Paris. He has been raised from kittenhood as the spoiled baby of Gür Gandine, an even more spoiled mega-popular jet-setting celebrity who dresses in yellow with black spots to match his fur. The two always appear together at night clubs, raves, and other venues of the idle rich; Doudou also wins first prizes at glitzy cat shows. Gür and Doudou have been in Paris, and are about to fly to Los Angeles. She throws a temper tantrum when told at Paris’ Charles de Gaulle Airport that Doudou must travel in a pet carrier, in storage, but to no avail. Doudou is stolen for ransom by two dishonest baggagemen, Victor and Hugo (ha, ha), who are clumsy and let Doudou escape into Paris, while Gür Gandine flies to Los Angeles. The rest of the book is about the pampered and naïve Doudou learning to live as a street cat in Paris while Olympe and her gang help him to search for his missing mistress. Olympe (she has other names given by the humans whom she allows to feed her; one for every day of the week) is his first teacher. He meets her friends, notably Miri, an unkempt, big-eyed, slightly crazy feline beat poet (“Oh, a new flea! Delighted, Miss, I hope you’ll enjoy yourself vagabonding on my back … and don’t hesitate to climb into my ear.”), and Cannelle, a sweet housecat who allows them to eat out of her cat dish while her owner is away. But Cannelle is too addicted to her catnip balls and her cat toys to venture outdoors with them. Olympe’s final friend is Nobel, the cat of an addicted collector of books, stuffed animals, and other high-class rarities, but therein is a major problem. Nobel’s human’s home is about to be repossessed by his bank for unpaid bills, and both human and Nobel expect to lose their luxurious house. They see on the TV news that the distraught Gür Gandine in Los Angeles is offering a €500,000 reward for the return of Doudou. When Nobel sees that Doudou is now traveling with Olympe’s clowder, he plots to lead his human to capture the ocelot for the reward and save their home. Ocelot isn’t labeled volume 1 of a series, but the story can’t stop there! There are other hooks for a sequel, such as Radge’s rival cat gang. But the lightweight-though-enjoyable story is mostly an excuse for the picturesque travelogue through Paris, with detailed portraits of such well-known landmarks as the Eiffel Tower and Notre Dame de Paris; and for the attractive and well-anthropomorphized feline cartoons of Doudou, Olympe, Miri, and the others. Ocelot isn’t an essential purchase, but you won’t feel that you wasted your money.
. . . . . Interesting.